Request a quote for a bulk order for UHRF1 polyclonal antibody - Classic. Please fill out the form here below. Your local sales account manager will get in touch with you shortly and send you a quotation based on your requirements. Polyclonal antibody raised in rabbit against UHRF1 (ubiquitin-like with PHD and ring finger domains 1), using a recombinant protein. ChIP was performed with HCT116 chromatin extract and 5 μg of either control rabbit IgG or UHRF1 antibody. The precipitated DNA was detected by PCR with primer set targeting to PPARG promoter. 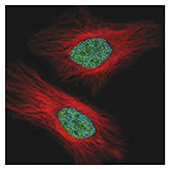 UHRF1 antibody immunoprecipitates UHRF1 protein in IP experiments. IP Sample: HeLa whole cell extract A. 40 μg HeLa whole cell extract B. 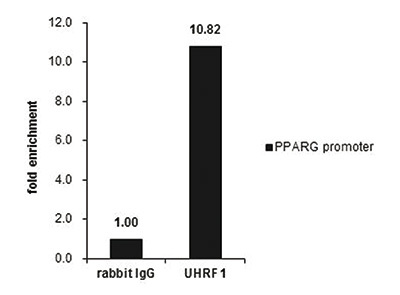 Control with 2 μg of preimmune rabbit IgG C. Immunoprecipitation of UHRF1 protein by 2 μg of UHRF1 antibody (C15410258) 5% SDS-PAGE The immunoprecipitated UHRF1 protein was detected by western blot with the UHRF1 antibody (C15410258) diluted 1:1,000. 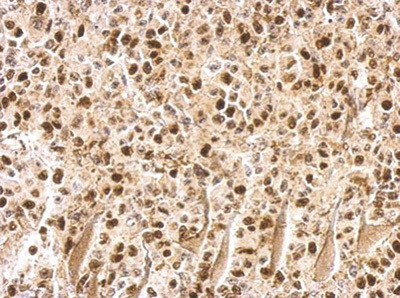 UHRF1 antibody detects UHRF1 protein on HBL435 xenograft by immunohistochemical analysis. Sample: Paraffin-embedded HBL435 xenograft. 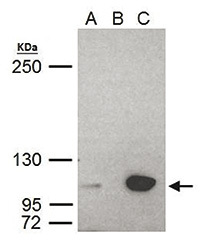 UHRF1 antibody (C15410258) dilution: 1:500. Confocal immunofluorescence analysis of paraformaldehyde-fixed HeLa cells using UHRF1 antibody (Cat. No. C15410258) (Green) at a 1:500 dilution. Red: Alpha-tubulin filaments. 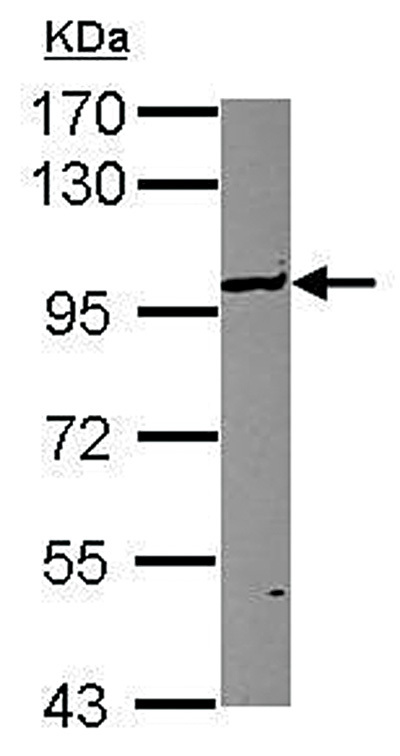 Diagenode strongly recommends using this:	UHRF1 polyclonal antibody - Classic (Diagenode Cat# C15410258-100 Lot# 40583). Click here to copy to clipboard.